Still working on catching up with the promised Christmas presents. This one is for my nephew. I asked my sister what size to make. She said a boy's 16. When I looked at the body measurements for the largest size in boys' patterns, they were exactly the same as the men's small. It made sense to me, to buy the men's pattern, because boys only grow larger, and I would certainly get more use from the men's pattern. The fabric is a cotton Japanese ikat - remnants "inherited" from a friend. I'd been musing over this fabric for a vest pour moi, but - it decided differently. It's still a vest. There are still a few skinny scraps left that may become a bag of some sort for me. Now that it's made up, the vest looks rather large, but, as I said - boys grow, so it won't be too large for long, I'm sure. I'm not going to spend too much time pondering what would have been the difference had I used a boy's pattern. Not too thrilled with the lining options that I came up with. The red on the ikat is rather a rusty tone. Pure red lining really didn't work. This rather orangey colour was actually the best choice. And yes, those are real welt pockets, not just fakes. According to instructions, the pocket should have been entirely made of the outer fabric. Given the thickness of the cotton, I thought that it would have made too big a lump, so I cut the pockets from a scrap of black lining fabric and attached a rectangle of the cotton for the part that would show. The buttons are vintage men's suit buttons. I don't say this often enough - thank-you for all the wonderful comments that get sent my way with every post. I do so love to hear from everyone. ... and welcome to those who have recently signed up as followers. I was in such a hurry yesterday to get the post done that I completely forgot to give credit where credit is due, and also to explain why I had to wash the blouse before wearing it. For starters, the grey print fabric is a very light-weight slithery polyester. Not the best of fabrics to work with. But thanks to Bunny's tip on using spray starch, I had no problems in doing the narrow hems on the bottom of the blouse or on the long ties. When it came to doing the cuffs, I used Sherry's expert advice on cuffs. Mind you, I did sew the sleeve to the cuff while the cuff was still flat, because I was a little afraid of how it was all going to line up, given the slitheriness of the fabric and my widening of the sleeve. But as far as doing the ends of the cuff - Sherry's advice worked like a charm. There is no interfacing in the front of the blouse, since the centre front just gets folded over twice. That got sprayed with starch a number of times to stiffen it before making buttonholes, but I was still afraid that the fabric would get chewed up by the sewing machine, so I placed 3 layers of "Aqua Magic" (a water soluble stabilizer) underneath. Needless to say, all that starch and stabilizer did not make for a very pretty looking result. Hence the need to run this through the washer and dryer. 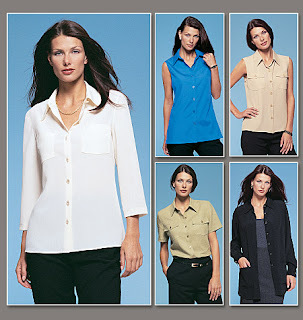 As much as I love to hate polyester - this blouse is an easy to care for addition to the wardrobe. I now have a resident photographer for the next 2 months (my daughter is here for a long visit), which means that taking photos should be an easier task, but I don't know how much my sewing time will get cut. As promised - the grey outfit. The skirt was cut last winter and forgotten. I was on a skirt kick, but then got tired of churning out skirts, one after another. Also, as I think I mentioned, I came to a standstill when I got to the bound buttonholes on the back vent. There's something very scary about cutting random holes in a garment, i.e. making buttonholes. I'm glad I finally finished this UFO. 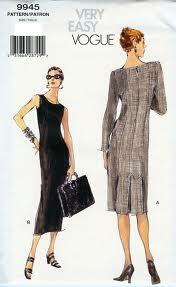 The pattern is Vogue 8542, c1992. The number has been reused for another pattern, and I was unable to locate a picture on the internet. Of course, I did not have the presence of mind to take a picture of the envelope until after I'd downloaded the other photos, so you'll just have to accept a description. It's a pegged straight skirt - 3 panels in front, 4 in the back. Given the vintage of the pattern, the lengths are rather odd for to-day, so that got altered. In the original pattern, the almost-ankle length skirt has buttonholes on the back vent, and I used that detail on my version. The fabric is a grey wool gabardine - not one of my favourite fabrics, because it always wants to be difficult. Pressing properly takes forever. I can't figure out why, despite being very careful, I ended up with little divets in the fabric fold next to each buttonhole. This happened after I finished the wrong side of the buttonhole. Yes, there's proper interfacing in there. I basted around each buttonhole, before starting the hand sewing. As for the odd placement of the last buttonhole - that wasn't planned that way. I made a "calculation error" when snipping off fabric for the mitre at the bottom of the vent, and had no choice, but to shorten the skirt a bit, and that threw off my careful buttonhole planning. See - it is scary cutting random holes in fabric! I decided that since I cannot see my back side when I'm wearing this skirt - I will ignore the shortcomings and wear it anyway. The blouse is Vogue 2634. Last note - may-be I need Rosy's son's opinion on whether this look is too Miss Marple? I have been overdosing on Miss Marple and Poirot DVDs, and that's probably why I decided that I needed this floppy bow look. Why is it that life just doesn't happen according to plan? Sewing is happening, but not quite as quickly as I'd wished. Grey skirt and blouse are done, but the blouse needed a run through the wash, so pictures haven't happened yet. I needed a birthday gift for a newly-minted teenager. I was out of ideas that didn't cost an arm and a leg. Then I spotted some stainless steel water bottles in the store. Everybody seems to be carrying them. Problem is - they're quite inconvenient to tote around. Light bulb went on - sewing needed to be done. I pulled some scraps out, quilted a rectangle, sewed up a seam, bound the top, boxed off the bottom, added a strap. Pretty straight forward, but as always, these things end up taking far longer than you think they will. With such hurry-up-and-get-it-done projects, I don't make notes, and I'm now thinking of making another holder, which means having to start from scratch with measurements. Oh, I do wish I'd think ahead about these things! The dress has been done for about a week. It hung waiting for its final pressing. Couldn't seem to get around to it. Had no real need to wear it. This morning I decided that it deserved its first outing, so dress got pressed and worn to church. No-one saw it, because I didn't take my coat off, but that's OK, because I knew what I was wearing. After church seemed a good a time as any for taking some pictures, so here it is. The pattern is Vogue 9945, which is from the late'90's, and now OOP. I also fully lined the dress, slightly redesigned the facings because of this and added strap keepers, because with a bateau-type neckline those pesky straps always try to put in an appearance. The lining fabric is also a Lilly Ann outlet buy from the same era as the wool. It's polyester. I had a RTW blouse in this fabric, and I didn't want another one like it so many decades later. Now I have leftover plaid fabric - enough for a skirt. As I was sewing, all sorts of ideas whirled around in my head. Plaid skirt/navy military-style jacket. 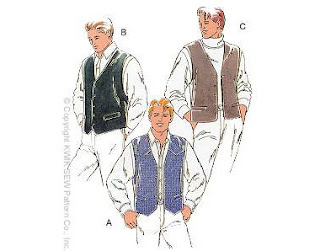 Found some ideas for restyling a pattern that I have. We'll see when that happens. I need a rest from matching little navy lines. I've "discovered" a grey skirt that I started last year. The bugaboo that stopped the project was the decision to make bound buttonhole on the back vent. Off it went into the UFO pile. Now it's back in production. Even found fabric for a blouse that will "make an outfit", so that I don't have an orphan. Even though the skirt is a wool, I guess I'm considering this already a "Spring" project. At the rate the weather 's going around here, I'll be wearing wool for some time to come yet. This morning my driveway was covered ankle-deep in the nasty white stuff, yet again.